With the real-time data available for the surface Green Line since mid-October, I thought I'd try some analysis with my gathered database. One thing we can look at is average speed of travel. Although the trains can ostensibly move at up to 25 mph in their dedicated lanes, or even faster off-street, they tend to spend a lot of time waiting at signaled intersections and station stops. 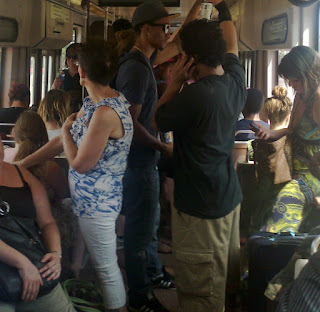 In fact, the more passengers that are trying to use the system, the slower trains tend to go: overcrowding results in long dwell times as it becomes harder and harder for people to squeeze on and off the train. This effect is made worse whenever the MBTA forces everyone to use only the front door for boarding and alighting the train. The front door is small, and it has stairs, which makes the process take much longer as everyone has to slowly file in and out of the tiny opening. The net result is that the Green Line can sometimes feel like it is traveling more slowly than if you walked. Well, perhaps that is hyperbole. However, it is possible to outrun a Green Line train on the "B" branch. A typical human runner, with some training, can sustain about 8-9 miles per hour. So we should expect to see average "B" branch speeds in a similar range. The first thing we can do is consult the schedule by using a convenient mapping website to plot a trip from Boston College to Blandford Street at 8 o'clock in the morning. We find that the MBTA expects a "B" train to take about 27 minutes to cover the approximately 4 mile distance. That's about 8.9 miles per hour. Does that match up with the findings from the real-time data? The following zoomable line chart is derived by calculating average speeds for the surface "B" branch during each hour of the day from 5 a.m. through 11 p.m., and breaking it down by week. So, for example, we can see that on the week of November 3rd, average speed at 8 a.m. was about 6.79 MPH and at 5 p.m. (hour 17) the average speed dropped to 6.61 MPH. That corresponds to an approximately 36 minute trip between Boston College and Blandford Street. Note that this chart does not distinguish one direction from another, so it is quite possible that the peak direction is much slower and the off-peak direction moves more quickly. Plot of "B" branch average speed in MPH for the hours of the day from 5 am until 11 pm, looking at each week in November and December separately. The weeks with the most rapid travel appear to be the final two weeks of December. This is not surprising. Much of the passenger load on the "B" branch comes from the universities, and those are on break during that time. Slightly surprising is the distant third-place finish for the week of Thanksgiving. Although the performance is better than the "normal" weeks, it is still rather low for a week when most students are traveling. In any case, the shape of the chart overall is telling. The two major valleys correspond to the traditional rush hours, when crowding on the Green Line grows extreme and dwell times increase accordingly. The most snappy performance is found either in the very early morning, or later in the evening. There seems to be a slight bump around 9 p.m. that might correspond to the late dinner and nightlife rush. The difference between an average speed of 6.61 MPH and 10 MPH doesn't seem like much, but it is actually quite a bit: that's a difference of 12 minutes in end-to-end trip times. 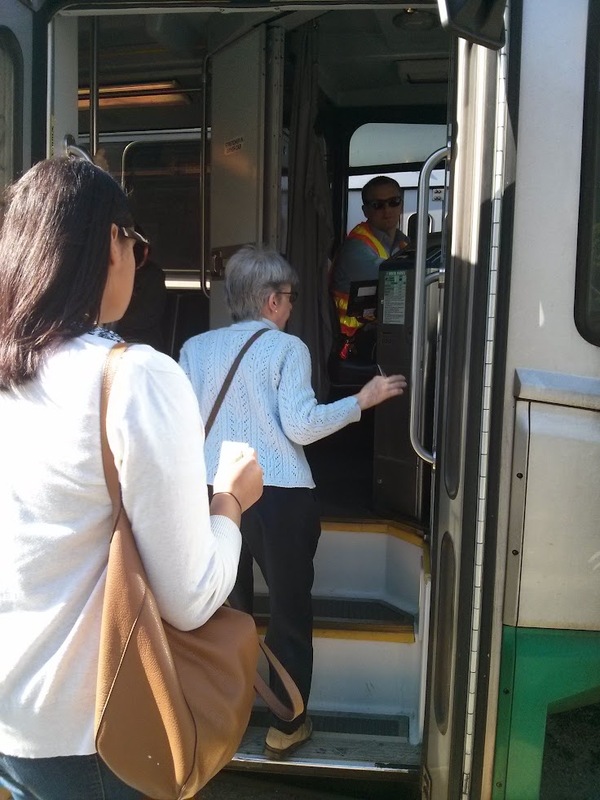 If the Green Line can manage an average speed of merely 10 MPH on a consistent basis, then a typical passenger can realize a savings of up to 12 minutes on their commute each way. That's pretty significant. Especially if you are able to increase reliability and cut out the variances that can sometimes lead to 15, 20 or more minute delays. That's why I find prosaic improvements such as proper station spacing, transit signal priority, and all-door boarding to be vital. They don't have the same flashy pizzazz as building a new section of subway. But they can achieve much of the same benefit at a fraction of the cost. If you run significantly faster service, you increase capacity. This is missed way too often in these discussions, but the cost of operation is really based on time, not distance (especially with electric service). If you can save 10% of travel time, you get 10% more service, because, say, you can run 11 trains every hour instead of 10, with the same number of trains! All of this seems to make perfect sense. When service is crowded at rush hour, you need longer dwell times at stations to allow for more boarding, and you may have some slowdowns because there are only 4 or 5 minutes between trains instead of 8 or 10, so the whole of the service takes 10-15% longer. Those numbers are wayhigher. But even here, the B line stands out. The C line has more variation but the 23 minute schedule is only early AM outbound; at other times the shortest time is 30 minutes, which would be a 40% difference, akin to the other lines. The B, C and E lines (and to a small extent, the D line) are able to skip stations when there are no passengers, which is why they have some more variation, but it still doesn't explain why the other lines have 10-15% differences and these lines are in the 35-65% range. If you were able to get the commute times to be 15% of the non-commute times, you could run the same level of service that is currently run with two fewer train sets than are currently run on each line, freeing up at least 8 cars (depending on the actual time saved) to add capacity to the system. Currently there are a total of 8/10 (evening/morning) train sets which are three-car trains, so you'd be doubling that capacity. If each of these additional cars took 90 minutes to run the full route (out and back, plus a recovery), you'd still run on the order of 6 additional inbound cars per hour, with each having a capacity north of 150 passengers, or 1000 people per hour. Or, if you decided not to run the cars, you'd save 8-10 vehicles per hour, times 8 hours of daily rush hour service, times, say, $150 per vehicle per hour (likely higher, I'm guessing here), meaning that you could run the same capacity you have today, at higher speeds, and save $3 million per year. Is that a drop in the bucket of the T's overall budget? Yes, it's not nothing. So the bit about "achieving a benefit at a fraction of the cost" is not really accurate: if properly implemented, it could either buy increased capacity, or save the T money. Neither of which is a bad thing.